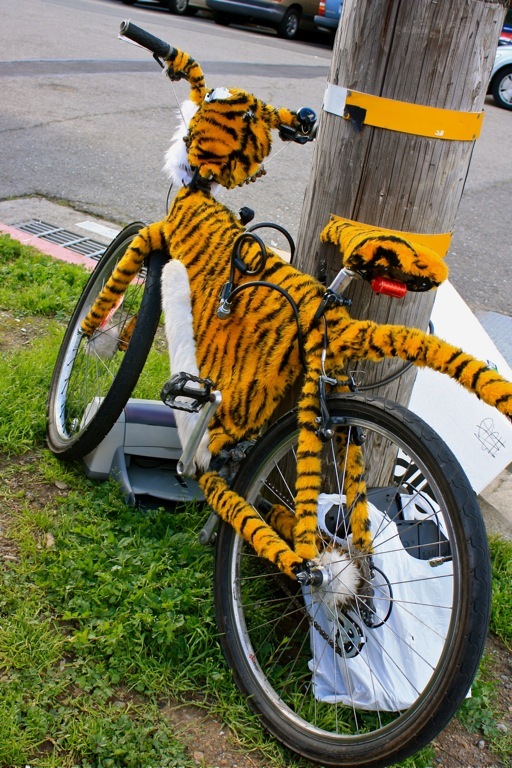 Ha, it would be fun to see who rides this tiger bike. LOL people there is so creative! I love it! I had heard Oakland was dangerous, but I didn't know you had tigers?! That brings new meaning to a blues song "There's A Tiger In My Tank. How cool is that? I wonder if they custom made it? is that unique or is it a common theme? That is pretty cute. You HAVE to find it some day with its rider. All of blogland demands an answer. «Louis» should have figured this out right away! It belongs to Tony the Tiger! That's not Tony's, it belongs to Chester Cheeto! Marvelous - you do have some interesting things on your streets. @Randy: lol... is he really riding a bike? :D Cheeto is good..
Spot on! A visual treat, nice framing work.